A lot of people underestimate garage sales these days. But you never know what gems you can dig up by going to garage sales in your area. In fact, many eBayers have made a living out of going through garage sales to find those amazing deals. In these tough times, there is no reason to pay more than you have to for things you need at home. That’s where iGarageSale comes in. iGarageSale is designed to find you garage sales in your area and help you save money at the same time. 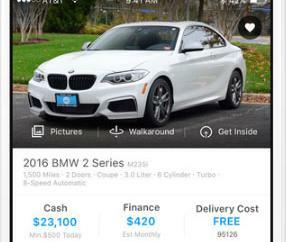 So what does make a top garage sale app? You want to be able to find garage sales all around you and get directions to them as well. That’s exactly what you get with iGarageSage. 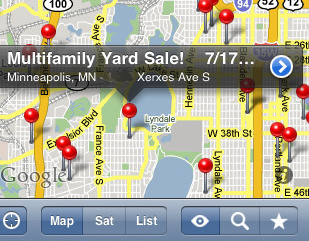 You can view garage sale events on a map or in the form of a list. The map feature comes very handy as it can give you a better idea whether it’s worth it for you to make a trip to a specific garage sale event. You can view garage sales based on day or week. Once you have found those that interest you, you can favorite them and return to them in the future. I like the fact that the app provides unfiltered results. 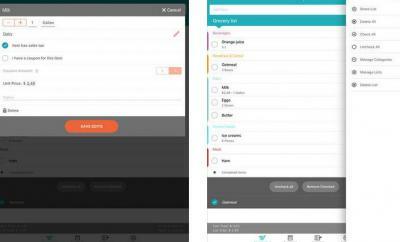 So you can search for things that you need without missing on too much. Once you have found the listings that you are interested in pursuing, you can share the information via e-mail. You can also share your maps on social media sites as well. 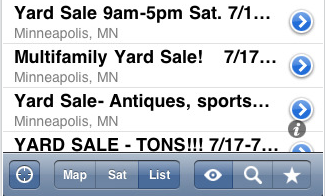 At the end of the day, iGarageSale finds you garage sale events and gives you directions to each event as well. Pretty handy for shoppers.